Bachelor fans are furious about last night’s episode, in which not-fan-favorite Arie Luyendyk Jr. ambushed his fiancée, Becca Kufrin, with a breakup while they were flanked by cameras. Vulture described the scene as, “a half-hour long spectacle of human misery and producer-driven exploitation,” and, in response, someone or some collection of people from the Bachelor Nation pooled enough resources to buy 16 billboards in Southern California and Becca’s home state of Minnesota, shaming Arie for his bad form. 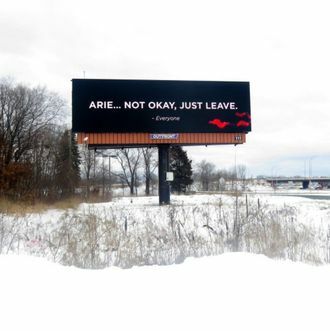 “Arie… Not okay. Just Leave,” read the billboards, which reference Arie’s following Becca around their shared home with cameras in tow while she cries, packs her belongings, and asks him to leave her alone. From snowy roadsides to sunny highways, make sure to pull over and snap a pic if you’re lucky enough to spot one of the Arie shame-boards. Update, March 7, 2018, at 9:50 a.m.: Bachelor Nation author Amy Kaufman reports that there are 17 billboards total, with 1 in Times Square.